I will be showing 172 Marlborough Avenue from 2 pm to 4 pm today. I'm looking forward to showing this charming 3 bedroom, 2 bedroom home with excellent access to the university, market, downtown and the beautiful parkland along the Rideau river. Wednesday June 29th is going to be a tricky day to get around Ottawa, with Canada hosting the North American Leaders' Summit. I'm sharing an article that outlines planned road, bridge and water closures this week. A quick note to say that Fletcher Garden will be hosting their annual native plant sale this Saturday June 4th from 9:30 am to 12:30 pm. More information can be found here. 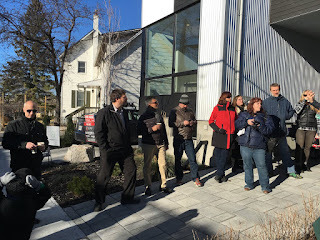 Great to see folks at at the open house at 172 Marlborough Avenue today. It's a charming 3 bedroom, 2 bathroom detached home in the best part of Sandy Hill! It has excellent access to the University, the market, downtown and the beautiful parkland along the Rideau. Happy to connect to discuss this great property. It's a hot, humid weekend - wishing all the best to everyone participating in race weekend events in Ottawa from the 2k to the full marathon. My street is right on the race route and I'll be out tomorrow with some cooling water for those who need it! It was great seeing folks out on the 28th! It was a beautiful day and wonderful to mark this place-making occasion. 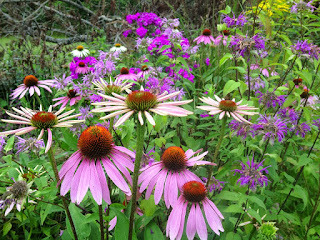 I'm sharing a few photos from the day. This Saturday, November 28, from 1:00 to 2:00, we are formally unveiling the long awaited mural on the concrete wall at 3 Lowrey. We will have live stencil demonstrations by the artist Arpi, music, and hot chocolate to warm you up. 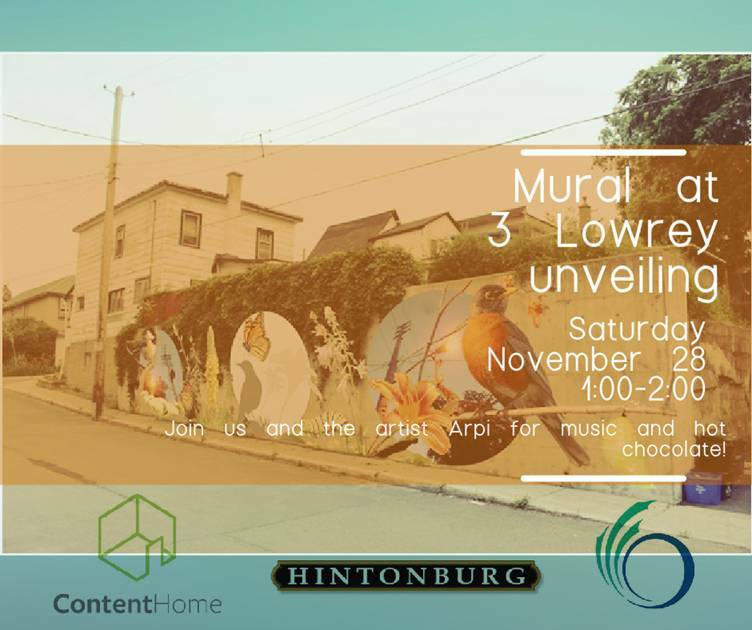 It will be a great celebration of art and creativity, which speaks to Hintonburg values. The mural at 3 Lowrey, at the corner of Lowrey St and Garland Street, was conceived of by Roger Senecal and Neel Bhatt, the principals of Content Home which developed a number of properties across the street from a blank concrete wall. Seeing the opportunity for something more, Content Home secured prominent street artist Arpi to design a unique and powerful piece to add some much needed vibrancy to the otherwise boring bit of concrete. 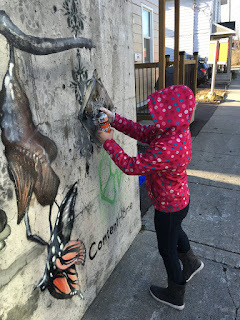 After a few hurdles, and with the support of the Hintonburg Community Association and the help of Kitchissippi ward councillor Jeff Leiper, the mural at 3 Lowrey has come to fruition. Arpi is a Montreal-born and -raised artist whose work has been appearing all over Ottawa, including Kitchissippi institutions such as Orange Art Gallery, The Hintonburg Public House, West End Well, and Railbender Tattoo Studio & Art Gallery. Arpi’s work walks the line between realism and abstraction, a concept familiar in Hintonburg as we balance new, modern developments with a unique character and history. The mural at 3 Lowrey is a vivid and compelling imagining of soft nature fusing with urbanism. Please join us in celebrating this great new addition to our neighbourhood. The mural by ARPI is underway! Here is a quick peek although it has evolved since I took this photo! Drop by Garland street - I will be hosting an open house at 11 Garland Street this Sunday from 2 - 4 pm.